Riki Turofsky has been recognized as one of the most versatile members of the Canadian arts community. 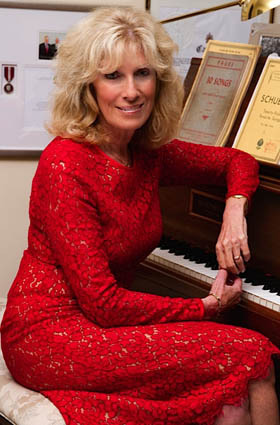 Since her professional singing debut in 1970, she has performed with virtually every opera company and symphony orchestra in Canada and many in the United States and Europe. She has been a successful broadcaster and has five recordings to her credit. (Performance résumé attached). After the illness and subsequent death of her only daughter in 1985, she curtailed her performing career, and began to concentrate her efforts on supporting not only the arts as a patron and advisor, but also as a philanthropist in the health and social services sectors. In 1996 she was appointed to the board of The Canada Council for the Arts. During her terms there she initiated the Policy for Racial Equity in the Arts. She was recognized and commended by the Minister of Heritage ‘for her commitment to the integration and equality of visible minorities in the arts in Canada’. She also was part of a small team that shaped the first Governance Policy for the Council. Miss Turofsky was a member of the Canadian Committee for UNESCO, and represented the council at many functions and spoke on their behalf. When she finished her full term at the Canada Council, Miss Turofsky became involved in her alma mater, The University of Toronto‘s Faculty of Music. She joined the Alumni Association and served as President in early 2000 for three years. She headed up a fundraising campaign for the Opera School that raised over $500,000 for an endowment, sat on the College of Electors of the university, and on the Dean’s Advisory Committee for the Music Faculty. She was honoured as a selfless contributor to the university, and received the prestigious Arbor Award for Volunteerism in 2000. In 2006 she established and continues to sponsor The Riki Turofsky Master Class Series in Voice that invites opera stars to coach and teach young opera singers in front of an audience. In 2006 she joined the board of the newly formed Food Banks Canada and served on it for six years. She spearheaded their fund raising programs and worked diligently on their Vision and Strategic Direction. She was motivated by the fact that over 900,000 Canadians each month are assisted by Food Banks. She believes that more effort should be focused on eradicating hunger in this country, and continues to be a donor and friend to the organization. Riki Turofsky was a founding member of the Fundraising Committee at Casey House Hospice. She organized and hosted a successful fundraiser at Roy Thomson Hall for this group. She also visited Casey House and performed for the patients there. After her daughter Carrie died, Miss Turofsky set up The Carrie Fund at the Mt. Sinai Hospital. This fund enables research into autoimmune diseases and continues to grow every year. Miss Turofsky and her husband Charles Petersen were inspired after his recovery from throat cancer, to become major supporters of Princess Margaret Hospital. They gratefully established a fellowship in Head and Neck cancer, and continue to support the fine work that this hospital does in Patient Care. They have recently sponsored a new hospital room in the upcoming addition at St. Michael’s hospital. In 2012, Miss Turofsky and her husband sponsored a new production of Gianni Schicchi and A Florentine Tragedy for the Canadian Opera Company. Miss Turofsky has been a member of The President’s Council and is now a Golden Circle donor at the Canadian Opera Company. In 2014 Miss Turofsky and Mr. Petersen co-sponsored Crazy For You at The Stratford Festival; in 2015 The Sound of Music, and will co-sponsor A Chorus Line in 2016. Many companies in the arts benefit from Miss Turofsky’s generosity. She has been a stalwart donor to Music Toronto for over 25 years, and continues to support the Toronto Summer Music Festival. The past three years Miss Turofsky has sponsored a young singer in the Vocal Academy of the Festival. She has given courses there, as well as at the Faculty of Music, on career preparation and positive performance attitude. Miss Turofsky continues to mentor young singers. In the fall of 2014, Miss Turofsky’s book Aria: Song of a Life was released. It is not only a memoir of her life as a performer, but is also about facing adversity and overcoming it. Her life of tragedy, loss, love, survival and success are the themes. The book has led to speaking engagements; the most recent one entitled Rising Above Hope, was a fundraiser for Youth Without Shelter. She motivates her audience to find happiness in each day no matter what life throws at you. She is a compelling speaker and has become an inspiration to those people who have met her. Miss Turofsky learned when she was young that when you help others you find happiness for yourself. She firmly believes in that tenet. Riki Turofsky thrilled and captivated audiences with her voice, and gave much pleasure to many people in Canada through her performances. She continues to make a difference to many lives with her philanthropy, volunteerism, and strong belief in helping others less fortunate than she. She received The Queen’s Golden Jubilee Medal in 2002 and The Diamond Jubilee Medal in 2012 for her contribution to Canada. The following is the formal biography taken from The Canadian Encyclopedia of Music in 2007. It was edited in 2013. Riki Turofsky. Soprano, broadcaster, video producer, author b Toronto, 20 Feb 1944. She began studies with the British Columbia Opera Ensemble, making her debut in 1967 in its touring production of Hansel and Gretel. She was awarded a place in the San Francisco Opera's Merola program in 1967 and studied at the Music Academy of the West with Martial Singher and Lotte Lehmann and 1968-70 at the University of Toronto with Irene Jessner, graduating in opera performance. After singing Oscar in the 1970 Vancouver Opera Association production of Un Ballo in Maschera she appeared that same year as Zerlina in Don Giovanni with the COC. Turofsky made her New York City Opera debut 27 Oct 1972 as Frasquita in Carmen and has performed with the Chattanooga Opera (1972), the Houston Grand Opera (1973, alternating with Beverly Sills in The Daughter of the Regiment), the Kansas City Lyric Opera (1975), and (in her European operatic debut, 10 Jun 1976) the Netherlands Opera as Curley's Wife in Carlisle Floyd's Of Mice and Men. In 1978 she was Titania in the Festival Ottawa production of Britten's A Midsummer Night's Dream, and with the COC, was Violetta in La Traviata and the Countess in the Marriage of Figaro. Turofsky was Gloria in the Guelph Spring Festival's 1988 production of Sydney Hodkinson's St. Carmen of the Main. Turofsky toured Europe in 1971 as soloist with the Festival Singers and has sung with the TS and the Toronto Mendelssohn Choir, the Hamilton Philharmonic, the Bach-Elgar Choir, and the McGill Chamber Orchestra. R. Murray Schafer's Hymn to Night, which she premiered with the CJRT Orchestra in 1978 and recorded with the CBC Vancouver Orchestra (CBC SM-364) in 1979, was commissioned for her, as was Michael Conway Baker's Eve of the Garden which she performed with the Hamilton Philharmonic in 1989.. She sang the Princess in the TV premiere (CBC, 1975) of Tibor Polgar'sThe Glove. In 1980 for the Aquitaine label she recorded a song recital, Jade Eyes (AQD-9064), with the guitarist Michael Laucke. In 1986 she recorded an album of Kurt Weill songs, Riki Turofsky sings Kurt Weill (Fanfare DFL-9026) and in 1988 a video of one of the songs, 'My Ship' was broadcast on the MuchMusic network. In 1978 Turofsky's career expanded to include broadcasting when she was host on the CBC's 'Summer Festival' and in 1984 she was heard daily on CBC's 'Festival Today' with arts interviews for the Toronto International Festival. She appeared as a country and western singer on CTV's 'Thrill of a Lifetime' in 1980 and in 1982 sang in a special concert entitled 'Together' with Sylvia Tyson and Kathryn Moses at Toronto's Harbourfront. In 1986 she became arts specialist with CBC-TV Vancouver on its 'World Stage '86,' 'Downtown Saturday Night' and her own daily show, 'Artsweek'. She has been a regular guest on TV Ontario's children's program 'Today's Special'. She has formed the company Riki Productions to disseminate arts information and produce videos. Since the time it was written I recorded one CD for my husband called A River So Long of easy listening favourites. A compilation of opera and operetta arias became a CD after the original tapes were discovered in my basement. This one is called The Lost Concert Tapes. It is taken from live broadcast performances and I love it. I was in my prime.